Medical Solutions for the 21st Century . . . Evidence From the Biological Mechanisms of Aging. Evolutionary Models Suggest There Are Specific Interventions that Make It Possible to Extend Human Longevity. CR extends longevity in organisms from yeast to mice, and postpones or prevents a remarkable array of diseases and age-dependent deterioration, without causing irreversible developmental or reproductive defects [(Sohal, Weindruch, Science 273, 59 (1996)]. By combining our knowledge of the molecular pathways that regulate longevity and CR, we can begin to develop a novel strategy to prevent diseases such as cancer, Alzheimer's, and vascular diseases. The molecular pathways involved in the regulation of chronological life span were identified at about the same time in yeast and worms. Similar to the life span of higher eukaryotes, the yeast chronological life span is determined by measuring survival time. However, aging in the unicellular yeast is also studied by measuring the number of buds generated by an individual mother cell (replicative life span). The down regulation of glucose-dependent signaling by mutations in the RAS2, CYR1/PKA, or SCH9 genes extends the yeast chronological life-span up to 300% and increases resistance to oxidative stress and heat shock. The down regulation of the CYR1/PKA pathways also extends the yeast replicative life span by a mechanism dependent on the silencing protein SIR2. Chronological life-span extension in yeast is mediated by stress-resistance transcription factors Msn 2 and Msn 4 and mitochondrial superoxide dismutase. In the worm, C. elegans, the down-regulation of the pathways that include DAF-2, AGE-1, and AKT-1/AKT-2 proteins extends survival up to 300% and increases thermotolerance and antioxidant defenses through stress resistance transcription factor DAF-16. These yeast and worm "longevity pathways" share several homologous proteins, including superoxide dismutase, catalase, heat shock proteins, and the serine threonine kinases SCH9 (yeast) and AKT-1/AKT-2 (worm). The conserved function of longevity genes is also supported by the role of a gene homologous to yeast SIR2 in extending longevity in worms. Thus chronological longevity in yeast and worms is extended by inactivation of pathways that promote growth and, by an increase in protection against oxidative damage, and other forms of stress. Systems that repair and replace damaged DNA, proteins, and lipids are also likely to play a major role in extending survival. Conserved genes also regulate longevity in fruit flies. Mutations that decrease the activity of the fly insulin/IGF-I-like pathway cause dwarfism, but nearly doubles longevity. These mutations also increase the expression of SOD and the storage of nutrients. The similarities between the yeast, worm and fly longevity regulatory pathways suggest that portions of these pathways have evolved from common ancestors. Because glucose and insulin/IGF-I signaling pathways are down-regulated in the absence of nutrients, mutations in these pathways may simulate starvation conditions. A decrease in IGF-I signaling may also extend longevity in mice. Mice homozygous for mutations in the Prop-1 or Pit-1 genes are dwarfs, but live 25 to 65% longer than wild-type. Prop-1or Pit-1 homozygotes are deficient in serum growth hormone, thyroid stimulating hormone, and prolactin as well as for IGF-I, which is secreted by liver cells upon stimulation with GH. The plasma GH deficiency appears to mediate the effects of Prop-1 and Pit-1 mutations on longevity, because the mice that cannot release GH in response to growth hormone releasing hormone also live longer. Furthermore, dwarf mice with high plasma GH but a 90% lower IGF-1 [GH receptor binding protein (GHR/BP) null mice] live longer than the wild-type mice. Taken together, these studies suggest that the reduction in plasma IGF-1 is responsible for a major portion of the life-span increase in dwarf, GH-deficient, and GHR/BP null mice. Mammals also exhibit an association between stress resistance and reduced IGF-1 signaling. The activities of antioxidant enzymes such as superoxide dismutase and catalase are decreased in murine hepatocytes exposed to GH or IGF-1 and in transgenic mice overexposing GH. In rats, IGF-1 attenuates cellular stress response and the expression of stress response proteins heat shock protein 72 and homoxygenase. The storage of fat or glycogen is another aspect of the stress response. In yeast, the down-regulation of the RAS2/CYR1/PKA pathway (where PKA is protein kinase A) results in the accumulation of glycogen, which is the major carbon source catabolized during periods of starvation. By contrast, in worms, flies and mice, the down-regulation of the insulin/IGF-1-like pathways results in the accumulation of fat. Dwarf mutations cause fat accumulation, which is reversed by administration of GH. IGF-1 deficiency also increases fat accumulation in humans. (see "Human GH/IGF-1 Deficiency Diseases" section). In mammals, fat is the major carbon source during long periods of starvation (hibernation), whereas glycogen provides glucose only during short period of fasting. Therefore, the switch between glycogen storage in yeast and fat storage in metazoans is consistent with the role of longevity regulatory pathways in inducing accumulation of the carbon source that would maximize long-term survival during period of starvation. The ability of GH and IGF-1 to lower antioxidant defenses in hepatocytes, as described above, indicates that IGF-1 can promote cellular damage and disease in mammals. Thirty years ago, Silberberg [Patho.Microbiol. 38, 417 (1972)] showed that Pit-1 dwarf mice, which are deficient in plasma GH and IGF-1, had less osteoarthritis than wild-type mice. Since then, high levels of IGF-1 have been associated with increased risk of several human diseases including breast, lung, colorectum, and prostate cancer. IGF-1 appears to also promote cancer in mice, as tumors in Pit-1 or Prop-1 dwarf mice are either reduced or delayed. Mice with elevated GH and IGF-1, instead exhibit severe kidney lesions and a much shorter life span. Liver adenomas and carcinomas, as well as heart lesions, are common in older mice that overexpress GH (although the GH levels are supraphysiological). The reduction of plasma GH and IGF-1 may also have beneficial therapeutic effects in diabetic neuropathy. The role of GH and IGF-I in age-dependent cognitive decline is unclear. Infusion of IGF-1 into the brains of old rats for 4 weeks partially reverses the age-dependent decline in memory, but has no effect on sensory motor skills. By contrast, Prop-1 dwarf mice show improved cognitive function compared with age-matched normal mice. Further studies are needed on the role of plasma IGF-1 in cognitive decline and neurodegenerative diseases. Diseases that result in either overproduction or reduction of plasma GH and/or IGF-1 can be informative for developing therapies that prevent multiple are related diseases. Human somatotroph adenomas of the pituitary gland can cause chronic secretion of excessive GH, resulting in acromegaly, which is associated with a major life-shortening from cardiovascular diseases and cancer. Treatment of acromegaly with somatostatin analogues decreases GH and IGF-1, resulting in clinical improvements. Although these studies imply a role for GH and IGF-1 in diseases of aging, the abnormally high GH levels in acromegaly patients provide limited information on the role of normal levels of GH in cancer and cardiovascular diseases. The dwarf phenotype of long-lived yeast, flies, and mice suggest that it will be difficult to extend human longevity without causing side effects. In fact, GH deficiency in humans can lead to reduced life expectancy and is associated with increased fat mass, reduced muscle and bone mass, behavioral problems, increased prevalence of hypertension, insulin resistance, and premature atherosclerosis. Thus the changes that accompany fat accumulation may counteract the putative beneficial effects of GH/IGF-1 deficiency in humans. The increased mortality is observed in GH deficient hypopituitary patients that, in most cases, also lack adrenocorticotrophic hormone (ACTH). By contrast, human mutations analogous to the Prop-1 mutations that extend longevity in rodents cause defects including dwarfism, wrinkled skin, and intellectual deficiency, but do not appear to shorten life span. Among the rare Prop-1 patients for whom life-span data are available, several surpassed the average life span, and one survived to age 91. Unlike most patients with GH deficiency, humans with Prop-1 mutations do not lack ACTH, raising the possibility that the increased mortality observed in hypopituitary patients is caused by ACTH and not GH deficiency. The human Laron Syndrome (LS) is caused by a deficit in the GH receptor and resembles GH deficiency clinically and biochemically. Laron Syndrome is characterized by high GH, but very low plasma IGF-1, very short stature, obesity, and impairments in physical and intellectual development. Later in life, LS causes hypercholesterolemia and glucose intolerance [Laron, J. Clin. Endocrinol. Metab. 84, 4397(1999)]. In summary, GH and IGF-1 deficiency in humans are associated with major defects and diseases. However, the normal (and possibly longer) life-span of a few individuals with mutations analogous to those that extend longevity in mice suggest that it may be possible to extend human longevity by reducing plasma GH and IGF-1 levels. Although studies in rodent models point to GH and IGF-1 as promoters of aging and age-related diseases, GH is prescribed extensively as an antiaging hormone. GH treatment can increase body mass and decrease adipose tissue in 61 to 81-year-old men with low plasma IGF-1 concentration, and long-term GH replacement therapy causes some improvement in patients with GH deficiencies. However, the "antiaging" effects of GH therapy are typically observed after short-term treatment of patients with low plasma GH. By contrast, chronically high GH levels increase the incidence of diseases, including cancer and kidney diseases in rodents, and increased cardiovascular diseases and cancer in human acromegaly patients. GH administration also increases the development of diabetes and glucose intolerance in healthy older women and men [Blackman, JAMA 288, 2282(2002)], and increases morbidity and mortality in patients that are clinically ill, even after short-term treatment. It is clear that a major and chronic increase in plasma GH/IGF-1 levels increases morbidity and mortality. 3. Decrease IGF-1 signaling by acting on either extracellular or intracellular targets. The well-characterized yeast and worm "longevity" pathways should provide templates for the identification of genes and drugs that regulate longevity and diseases in mammals.  Concept diagram illustrates a path from basic genome data to a more detailed understanding of complex molecular and cellular systems, and the need to develop new computational analysis, and modeling and simulation capabilities to meet this goal.  The points on the plot are very approximate, depending greatly on how each problem is abstracted and represented computationally.  Research is under way to create the mathematics, algorithms, and computer architectures required to understand each level of biological complexity. 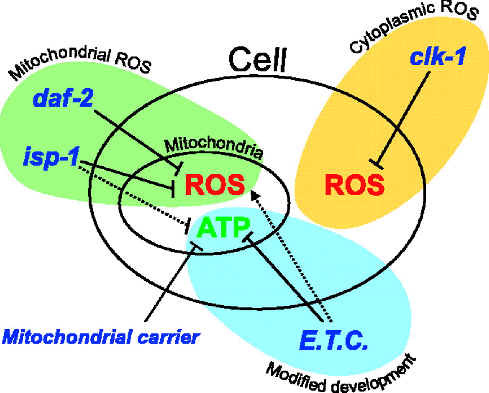 SCHEMATIC REPRESENTATION OF THE ACTION OF LIFE-SPAN-DETERMINING GENES ON MITOCHONDRIAL FUNCTION AND ROS FORMATION.  The dotted arrows represent actions that are likely but that have not yet been formally demonstrated.  Mutations in isp-1 and daf-2 protect the organism from mitochondrial ROS by preventing their formation and increasing their detoxification, respectively.  Mutations in clk-1 protect from cytoplasmic ROS by replacing UQ with DMQ, which is thought to lead to reduced oxidative stress.  RNAi against genes that encode major subunits of the ETC induces a developmental change that slows down subsequent adult aging by an unknown process.  RNAi against genes that encode mitochondrial carriers of unknown function lead to a decrease of ATP levels and an increase in life-span.  Recent progress in the science of aging is driven largely by the use of model systems, ranging from yeast and nematodes to mice.  These models have revealed conservation in genetic pathways that balance energy production and its damaging by-products with pathways that preserve somatic maintenance.  Maintaining genome integrity has emerged as a major factor in longevity and cell viability. Evolutionary theory correctly asserts that aging is not an adaptive trait, but that many organismal functions are bound to fail with time, because none could have evolved to last indefinitely. However, the mechanisms of aging are nonetheless more specific than previously thought. The findings on life-span determination in C. elegans suggest that ROS (reactive oxygen species) which are an inevitable consequence of life in an oxygen-rich world, are a leading proximal cause of aging. The results with SIR2 genes to silence the expression of other regulatory genes promotes longevity by reducing toxic overproduction of ribosomal DNA repeats. This silencing reduces gene expression and genomic instability in the nucleus. The results with SIR2 indicate that organisms have evolved ways to endure times of environmental stress, and so have developed regulator processes that implement survival strategies. Because organisms are not designed to last forever, and genetic changes are needed for natural selection, is it possible that normal aging is caused, in part, by inadequately repaired DNA damage? Genomic maintenance is necessary imperfect. Mutations in one or a few of the possible hundreds of genes involved may increase its imperfect nature in a tissue-specific manner, but might never completely mimic normal aging. Hence, the accelerated aging symptoms in humans and mice with genetic defects in genome maintenance strongly suggest that genomic instability, driven by oxidative damage further supports the hypothesis of ROS damaging by-products being the primary cause of normal aging. 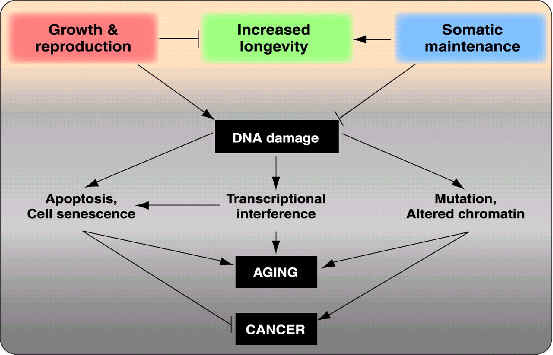 Thus, facilitating genetic or pharmacologic interventions that reduce oxidative damage to DNA, promote DNA repair, or optimize the cellular responses to DNA damage appear to be the most effective pathway to prolong healthy life ("health-span") and delay aging. The physiological changes that allow for survival must impinge on the processes limiting life span, in particular ROS production and detoxification. Life span, therefore, appears to be regulated in these situations in spite of the fact that it is not the feature shaped adaptively by natural selection.